Satya Nadella is a man with a formidable challenge. Microsoft CEO's predecessor, Steve Ballmer, squandered the company's mobile fortunes. From smartphone platform leader a decade ago, the software-and-services giant is a category also-ran in 2015. Microsoft has no independent mobile platform future. The war is over. There remains this: Making alliances with old enemies to preserve existing territory, while using the foothold to reach into new frontiers. Made available August 5th, Outlook for Apple Watch is a very smart move and metaphor for what went wrong on Microsoft mobile platforms and what has to go right to preserve and extend the legacy applications stack. While Windows 10 makes its way to Lumia devices, the future is Android and iOS and how the company supports them with contextually meaningful cloud-connected apps and services. I told you so—and Microsoft over the last 10 years. Seriously, the company should look back at my past writings and make me a future consultant. Because my analysis was right many times over. While I started warning about things to come as long ago as 2004, those writings are gone from the web because the two blogs closed (one as a result of an analyst firm's acquisition and the other after the media organization downsized). Best references must be BetaNews stories starting in 2009. Let's recap using 10. It's game over now, and Microsoft has lent Google a helping hand in self-destruction...Sync is the glue binding together cloud services and mobile devices...Where is Microsoft's sync strategy? In too many ways, it's stalled. Microsoft sync is scattered across consumer products, although it's more vertically defined in the enterprise. But even enterprise advantages can't make up for what's missing: A cohesive mobile operating system, sync service, and device strategy. Microsoft has mobile pieces in place, but it's a puzzle apart. Other companies are innovating in sync—and delivering real and useful products now—whereas Microsoft makes promises of something better to come. Google gets sync, and Microsoft didn't but does now. In December 2010, I heralded synchronization as technology of the year. Why is sync so important? Because during the contextual cloud computing era, content matters more than applications or devices and access to it anytime, anywhere, and on anything. Microsoft previously failed because it focused too much on directly preserving its application stack—Windows, Office, Windows Server, and related server software. While technologies like ActiveSync were trendsetting, they too closely tied to the enterprise app stack. Enormously bigger than that for PCs. For every PC in use there are three cell phones, based on analyst estimates. Data from the story: Microsoft's operating system share of the U.S. smartphone market fell from about 39 percent in June 2007 to 16.5 percent in December 2009. Meanwhile Apple's platform rose from zero to 25.5 percent during the same time period. As I explained in the analysis, Microsoft needed its own phone, but shipping then in 2010, with a supporting app store, which Apple and Google already turned to advantage for their platforms. 3. "Microsoft's Stephen Elop moves to Nokia—what a waste", September 2010. Headline is almost explanation enough. The only context that made sense to me was Elop as Microsoft's ambassador for preparing special partnership or even a takeover. From the story, putting past predictions into future reality, here is why you can't trust analyst crystal balls: "Gartner made a startling forecast about mobile operating systems—Android OS sales would all but catch Nokia's Symbian OS by 2014". Gartner made the prediction the day I posted; Android surpassed Symbian three months later. Microsoft's and Nokia's responses to the changing mobile market, where Android and iOS became important operating systems in less than three years, is appalling. It's simply outrageous to assert they will cause disruption and act with speed now, given the enormous challenges a major platform switch will entail. Two burning platforms don't make one that's right. 5. "If Windows Phone is No. 2 by 2015, I'll kiss Steve Ballmer's feet", March 2011. A month after the companies cut the deal and another example of trade analyst dumb-foolery, IDC predicted that Microsoft's global smartphone OS share would reach 20.9 percent, placing it behind predicted top-ranked Android but ahead of iOS. You can read the post to find then why I thought the prediction would be wrong now. 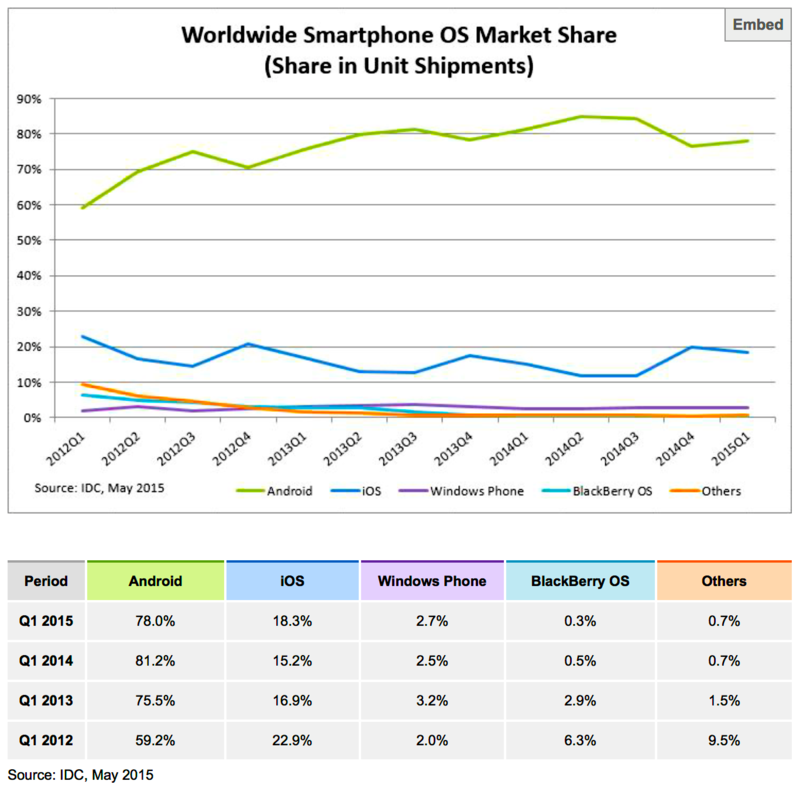 Reality check: During first quarter 2015, Microsoft's smartphone OS share was 2.7 percent, according to IDC. Thirty-year-old movie "Back to the Future" got more right about the year 2015 than IDC's four-year forecast. There's still time for redemption, though. In June 2012, IDC reiterated the No. 2 prediction for 2016, and I pledged to clean Steve Ballmer's toilet, if true. 6. "Nokia does the Windows Phone death dance", April 2012: ""Nokia will lose customers and market share. It's the inevitable consequence of such a massive operating system switch. Timing is terrible". Referring back to the 14-month-old deal: Elop "chucked away the most successful mobile operating system on the planet—with install base that dwarfed Android and iOS. The only thing burning about Symbian and planned successor Meego was the fire Elop set. He burned down the house—no, he nuked the city—in order to build anew". During first quarter 2012, when the first Windows Phone handsets shipped, Nokia posted a $1.76 billion loss, while sales collapsed by 29 percent annually and 26 percent sequentially. I called Microsoft snd Nokia "misfits" two months later. Fast-forward to summer 2015, and Microsoft ends its fiscal year by writing down $7.6 billion related to the Nokia acquisition, after dismissing Elop. Microsoft's merger and painful platform transition killed Nokia. 7. "Microsoft moves your Office to the cloud", July 2012. Even while Ballmer lame-ducked the company along, the cloud strategy started shifting to something more sensible for embracing anytime, anywhere, on-anything computing and preserving the legacy applications stack. From the analysis: "The software giant is in process of completely reinventing Office for the cloud-connected device era. The new Office is just that—a new office for you to do you work. Your new cubicle is outdoors, or anywhere you want to be". That could be Windows device, Mac, or even iPhone. A year later, I asserted that "Microsoft shouldn't do Office for Android", and about that I was wrong. Look to the next subhead for reasons why. 8. "Microsoft is cooler than Apple", June 2014: "The winds blow in a fresh direction, if only new Microsoft CEO Satya Nadella and his leadership team can raise the sails and turn the sloop to catch the breeze. Microsoft's devices and services strategy is succeeding". Innovation is a word that isn't applied enough to Big M. But it's deserved during the mid-2010 decade, as synchronization, cloud services, and plethora of compelling contextual apps available for multiple platforms all converge together. That's without mentioning Windows 10's launch in 2015. Microsoft's efforts to tie the platform to existing strong-hold products like Exchange and Office are more sensible today than four years ago, in part because the platform and the integrated strategy around it has matured. I bought the Nokia Lumia Icon, and to my surprise really enjoy using Windows Phone 8. But I got the phone anticipating Surface Pro 3, purchased day of availability. Like someone choosing iPod and a Mac a decade ago: Product synergy. Windows 10 and the supporting services and apps are tying together as one but extended across competing platforms. That's a recipe for reinvention and success, but beyond Lumia devices. I would absolutely recommend Surface Pro 3 before any Mac laptop. Touchscreen, pen, and the utility built around them is exceptional, and Microsoft's supporting cloud services offer amazing anytime, anywhere, on-anything benefits that Apple can't match. Microsoft's catch-up efforts around cloud storage, sync, and supporting services are commendable. I should sometime soon write a news analysis about "modern" Microsoft. The company is undergoing Renaissance—real reinvention—that mostly is held back by business customers slow to change. Many never will. Ballmer deserves some credit for setting Nadella on the right path, after stumbling around for a decade lost, chasing Google rather than leaping around it. Windows on phones is a dead-end. Ballmer bungled badly any hope for revival. Recovery is impossible, even as mobility defines the next computing era. No wait, what he did wrong is much worse. The former CEO ruined one of the company's three major software platforms—Windows on any device. Office and the server remain, supporting the applications stack shooting to cloud services. Windows 10 course corrects somewhat, but to what end? The PC's future is decline before the advancing mobile device horde, where Android and iOS dominate. As Windows' long success shows: Making gains against a platform with enormous market share supported by entrenched apps and loyal customers is nearly impossible. With 96-percent combined smartphone share, according to IDC, Android and iOS are unstoppable. By the numbers, from Gartner for 2014: Among 2.38 billion devices shipped (PCs, smartphones, and tablets), only 14 percent had Windows compared to 49 percent Android or 11 percent iOS/OS X. The PC's inevitable decline is near certainty, taking along Windows. Foreshadowing: In a report released August 6, Ofcom says "UK now a smartphone society". Two-thirds of adults use smartphones, and one third of Internet users "see their smartphone as the most important device for going online, compared to 30 percent who are still sticking with their laptop". Office Cloud. While Windows wallows, Microsoft's application platforms are in better form, despite competition from cloud or mobile apps. Much benefit comes from entrenched enterprise adoption. Then there are the habituals. For example, most of the BetaNews staff write stories in Microsoft Word, because it's what they are accustomed. I don't. The software-and-service giant took great risks taking Office to the cloud, for many reasons. Such as: Internal execution and resistance to how people are accustomed using the software. But, overall, Office 365 is a success that extends the relevancy of the legacy app stack while creating new relevance across more devices than just the PC. Android and iOS are key part of the broader strategy and demonstrates how necessity is the mother of innovation. If Windows mobile market share wasn't so low, and the future so grim, maybe the company would have kept to its longstanding siloed strategy of primarily favoring its own platforms. Instead, bringing Office and supporting productivity apps to all major platforms is exactly the right approach for the anytime, anywhere, on-anything computing era. Commercial seats grew 74 percent, and Office 365 is now deployed in four out of five Fortune 500 enterprises, with more than half of that install base using premium workloads. We also added over 50,000 small-and medium-sized business customers each month...We currently have more than 15 million Office 365 consumer subscribers, with new customers signing up at a current pace of nearly one million per month. We also surpassed 150 million downloads of Office mobile to iOS and Android devices. Based on smartphone subscriptions (2.6 billion globally) that Ericsson released in June, Office 365 could be on 5 percent of all handsets running the operating systems. Better Together. By my count, Microsoft offers more than about 70 separate apps from the iOS store, with the majority related to content creation or information (yes, there are some games). Unless, I miscounted, the number is a wee bit greater for Android. Additionally, Excel, PowerPoint, One Drive, Outlook, Translator, and Word are among the Microsoft apps supporting Apple Watch. That puts the company among the top developers on platforms with which it competes. By contrast, I count 55 Google apps for iPhone and none for Apple Watch. For Android: 100. From Apple: 16 for iPhone and 17 for iPad. When you view everything as a continuum, the use of one thing to encourage the use of another and another, support for rival platforms makes sense. That's how Microsoft preserves the relevancy of products like Office—by moving existing customers to subscription sales, while winning over new users on devices that matter more than PCs. Microsoft has long had a development philosophy at one time called "better together". The idea being Windows is good but better with Office, which is better with Exchange, which requires Windows Server—and so on. The fundamental characteristics: Better along the enterprise applications stack and best when primarily using Microsoft software or extended services. Microsoft's colossal failure to succeed in mobile devices should have been disaster, and I'm not fully convinced it isn't averted. But the company adapted better together. By integrating around the cloud as the platform, rather than localized operating systems that the company controls, Microsoft embraces the new while extending the relevancy of the old. The company fumbled this strategy over the course of a decade, with names like software-as-a-service, before starting to seriously take risks that turned assured obsolescence into a Hollywood-style redemption story. Apple Watch. The challenge now: How to invade Android and iOS with platforms around which developers can independently create applications or to provide killer applications that users can't live without. Outlook is one of Microsoft's most valuable assets, whether accessed from device or web browser. Supporting Apple Watch may be a head scratcher for some people, but the sense is clear to me. It's all about maintaining and extending cloud-connected service apps relevancy. Distinguishing this app are features Apple Watch owners using the default messenger will find familiar: Email viewing, canned replies, emojis, and voice-dictated responses. It's all contextual, by providing what you want where you need it. Needs change with context, You might respond to an email on the golf course that otherwise could be missed or ignored. But your interaction and expectation about capabilities change on phone or PC. Outlook for Apple Watch represents Microsoft's future. As a broader service, I find Outlook to easily offer better benefits than Gmail, although I'm no fan of Microsoft's cluttered, cumbersome desktop client. Coincidentally, over the weekend, I will decide where to move my domain primarily used for email; migrating from Google Apps. I can put up with Gmail for free, but not if I'm paying. Maybe Microsoft will get my hosting. Wrapping up, if Microsoft really wants to be disruptive in a way the benefits its interests and that of existing and potential customers, platform invasion must be the browser. Bring forth Edge for Android and iOS. Chrome could use some serious competition on Google's turf. Let Edge cut competitors deep.